The Wireless Secondary Control Panel (378LM) is specifically designed for people who want an extra control panel in their garage. Provides fast, easy installation with no wiring required. Compatible with all 315 MHz garage door openers. Install anywhere in the garage – near the garage door, near the garage access door – as long as it’s in the line of sight of the garage door. 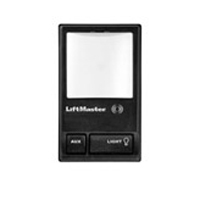 Has a large push button that opens and closes the garage door, along with a button that turns opener lights on or off. An auxiliary button can be programmed to open and close a second garage door opener, too.